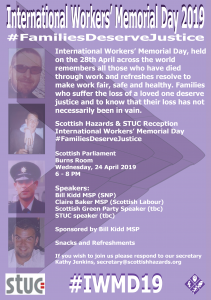 We are pleased to extend an invitation in conjunction with the STUC to an evening reception in the Scottish Parliament to mark International Workers’ Memorial Day, sponsored by Bill Kidd MSP. IWMD is held annually on 28 April to remember all those who have died through work and it to reinvigorate the resolve to make work fair, safe and healthy. Families who suffer the loss of a loved one deserved justice and to know that their loss has not necessarily been in vain. We will also hear from Bill Kidd, a Green MSP and a spokesperson from the STUC. The reception will take place in the Parliament’s Burns Room, from 6pm ’til 8pm on Wednesday 24 April 2019. Snacks and refreshments will be available.